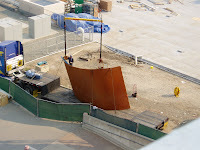 Last week one of Richard Serra's sculptures arrived at LACMA. 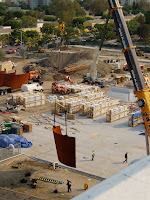 I work on the 5th floor of the LACMA West building, formally the May Co. Out on the balcony we had a spectacular view and I was able to take a bunch of photos. 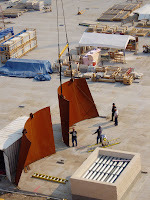 Serra's sculptures are enormous and transform space. Two of his sculptures will be on view in LACMA's new contemporary art building, Broad Contemporary Art Museum, opening in mid-February. 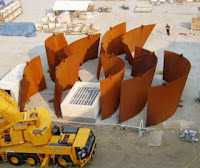 The artwork arrived in pieces on semi-trucks. Here is the view of the new building from my office. 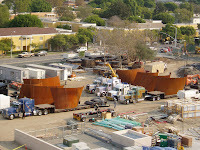 Check out how the pieces of the sculpture dwarfs the trucks! See the man on the ladder at the top of the piece? 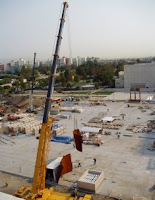 he's attaching cables from a crane. All the pieces that have arrived so far are in a staging area waiting to be installed in the building. I still can't fathom how that will happen! 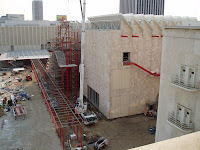 Exciting times at LACMA!!! I know I haven't written on this blog for ions. There are many excuses, mostly technical (my computer died). But it is just too boring for anyone to read about that. Anyway, since my friend Ellen mentioned me on her blog, I feel like I should at least post SOMETHING new. -I had a knitting break through last summer about tension thanks to Samantha at Abuelita's in South Pasadena. I was holding the yarn too loose, perfect for crochet, but not right for knitting. Then I went the opposite direction and my knitting was too tight. (On knit rows it was hard to get the needle in) I'm working on loosening up. - I finished a crochet wrap. It is long and airy. I used Koigu in black and the biggest hook I have- a "p". It is fast becoming my favorite accessory. -I started my first sweater. I'm using a variagated hand painted Aruacana cotton in lovely shades of green. I have the back completed, and I cast-on the front. 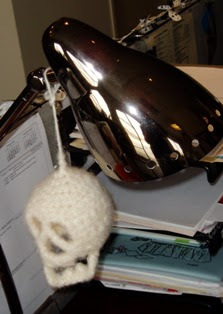 -On Ellen's suggestion, I'm crocheting a felted skull. Super fast project and the pattern is free from Lion Brand Yarn I just have one more round to do (I finisned most of it in less than an hour) and I need to felt it. - I took a sock class at Abuelita's and made my first baby sock. (I'll post pics later.) It is so cute and I love it so much that I carry it around in my pocket like a talisman. This was my first time on double pointed needles. My knit world opened up. -I crocheted a hat as fast as I could last week to send to Afghans for Afghans. They had a deadline for today to send out 80 cartons of knitted goods for children in Afghanistan. I've been wanting to participate in this project since I picked up the hook. I'll post a pic later. -on the needles I have a hat that I'm making for Jake. It's kind of a practice hat- I've never knit one, and I want to use my new double pointed skills. Jake and I are adding to our feline family. In the pictures he is only 4 weeks old. This weekend he’ll be six weeks. We might pick him up this weekend or when he is 8 weeks depending on whether his teenage mom is still letting her little ones suckle. (she had a litter of six!) Here are possible names: Dorian Gray or Sasha. Jake and I are smitten. We hope Dervish and Dixie love him too. As you can see, he didn't want to sit still for portraiture. I have been reading Los Angeles poet and instructor Terry Wolverton's new (simply wonderful) book- Shadow and Praise. In the praise section, there is a poem to knitting. I asked Terry if I could post her poems on my blog. This book is in two sections. The second section is a series of "praise" poems. The praise poems are linked by images. What she does is that she praises something that appears in the last few lines of the previous poem. So unexpected. As I was reading them, I kept wondering, what is she going to praise next? However it may appear, nothing is straightforward. Always a tangle, a twist, slip knot turning wrist to wrest my grasp on simplicity. Complicit, I drop stitches too. Gasp. Knit one. 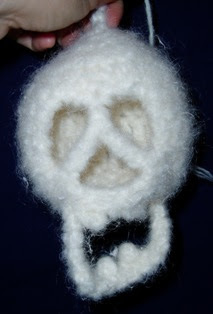 Purl two. Nine perfect rows before the pattern switches and I am ribbing. Then I make my home in a new motif. No relief until a wave of worsted undulates across my weathered lap, spills forward to lap my toes. Fevered in summertime, blanket of seed stitch and cable. Troubled hands possessed, I cast on (and on) but where do I bind off? I’ve lost the thread. Forehead puckers. Days unravel, wasted skein. Lulled by needles’ tick. Needles prick my torpid senses. Hope was not quick enough to join the jailbreak. Her punkass cousins split at the first crack of daylight. Provoked a fracas that swarms the planet still. That’s why I always sign my name with spit. It being her nature, she made the best of prolonged captivity. Grew accustomed to the scent of cedar, sedentary lifestyle. Taught herself to knit. Wingbone needles in her small hands. She yoked a sweater of resignation to replace her original plumage. Now it’s all the rage on the runway. That’s why I speak in my father’s stutter. Someday, she thinks, her hapless guardian might lift the lid again. Her walls grow redolent of wool. Needles clack like bones. Hope knits. What do I know with my eyes? I am a child today, lost in fog. Mist spatters my car windows; it’s difficult to breathe. Chimes in wind. Musical bracelets. Perfumed hands more chemical than flower. In the mirror, my eyes are innocent. Marbled and grave. On the anniversary of really looking. I never heard buzzing till the lights were dimmed. My mouth tastes dull and old, the gray of tepid water. Air hisses through swollen cavities. Pen presses its indentation to my middle finger, a palpable effort of words. I wear this mark. I hold so hard. Try as it might, sun can’t push through. Not this day. I see what I see. The rest sloughs off. I teeter on the border of the tangible. Crochet and all things yarny. Literary arts, especially poetry. Buddhism. Gardening. Food. Museums. Visual art. Running. I am native of Los Angeles of Ecuadorian and Czechoslovakian Jewish decent. Musuem educator, runner, poet and I am nutso about crochet and knitting.